2-tiered children birthday cakes are getting popular. I love to make 2-tiered birthday cakes too. It offers 3 levels of space for decoration. I can put the figurines on 3 different levels without crowding the space and every figurines can be seen clearly. There are more sense of depth visually and the deco are more lively and attractive. The sizes of the cake tiers could be 6" and 8" for simpler design or 6" and 9" to accomodate more figuriens. Each cake can feed around 35 - 45 pax, so if you have a small party with close family members and friends, it should be just nice. Whenever my clients ask for a cake with this feeding size, I would usually suggest a 2-tiered cake instead of a single tier 'big' cake to them. 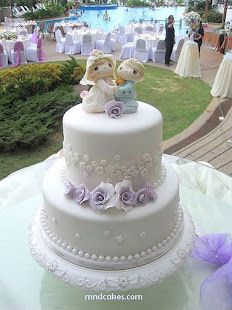 Whatever theme you ask for, 2-tiered cake can be easily used as a platform to showcase it. It is so versatile! ﻿Look at our 2-tiered Pororo cake, Baby TV cake and cutie animals castle cake, aren't you agree what I have written here is correct? If you don't think so, please let me know the reason, hehehe!